It appears I am on a bit of a Fall themed chocolate covered pretzel kick. Honestly if I had known I was going to find so many cute ideas, I would have just done a round up...but one things just led to another! I wasn't even looking for these cute pretzel trees. I stumbled upon them on Jasmin's blog. These trees get extra points because they have caramel! And they use pretzel crisps! YUM! 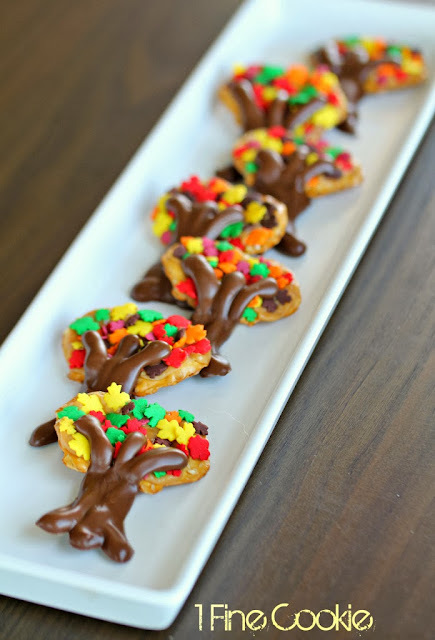 You can find out how to make Thanksgiving caramel chocolate pretzel trees over at 1 Fine Cookie.